It’s time for another book review! 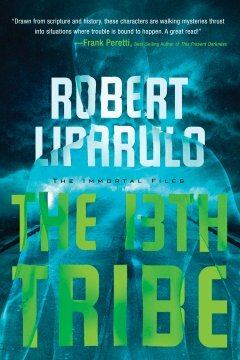 This time I had the opportunity to review “The 13th Tribe” by Robert Liparulo. This book is set in modern time but yet the characters have been around for over 3500 years. How is this possible? They are immortal. They have been since Moses went up the mountain to get the 10 commandments. While Moses was up on Mt. Sinai the twelve tribes got tired of waiting and began worshiping a golden calf. Many died immediately but forty of them were sentenced to endless life on earth with no chance of ever seeing the face of God. They are called the 13th tribe. These group of people have been trying to earn their way into heaven ever since. They believe that the only way they can do it is by killing sinners. They feel like God will honor them if they do this for him….not quite grasping the concept of grace…or that you can’t get into Heaven by your “good works”. They are brilliant people who have done many things in history to get rid of “sinners”…and have a master plan in motion to get rid of huge amount…thus hoping to earn God’s great favour on them. Insert the main character…Jagger. He is a security guard on an archaeological dig near Mount Sinai. He is to protect the land and the people that are there digging. Little does he know that him and his family will be thrown into the plans of the 13th tribe…by accident…or is it? This the first book that I have read by Robert Liparulo and honestly I was not a big fan. I felt like added more detail than necessary, thus making the book much longer than it really needed to be. I believe there an author can over describe…and feel this is was Liparulo has done in this case. I felt like it took forever to get to a plot and then when it happened I felt like it was over with a snap of the fingers. The rest of the story carried on…not very entertaining…or keeping me hooked until the very end. The plot thickened, things were discovered that I think were supposed to be shocking but were not really, and then the book was over without explaining how some things ended. All in all I think this was a very weak book. I’m a huge Ted Dekker fan and was excited to read this book because he wrote a review on the back cover saying he recommended this. Because of this, I thought this was going to be an excellent book, but it turned out to be a very disappointing read for me. However, if you like books by Frank Peretti then you will probably like this book. Definitely not a book I will read again. That being said, if I had a chance to read some of Robert Liparulo’s other books for free I may do so if recommended by a friend. I give this book 3 out of 5 lollipops. A Pinterest find – Nutella snacks.